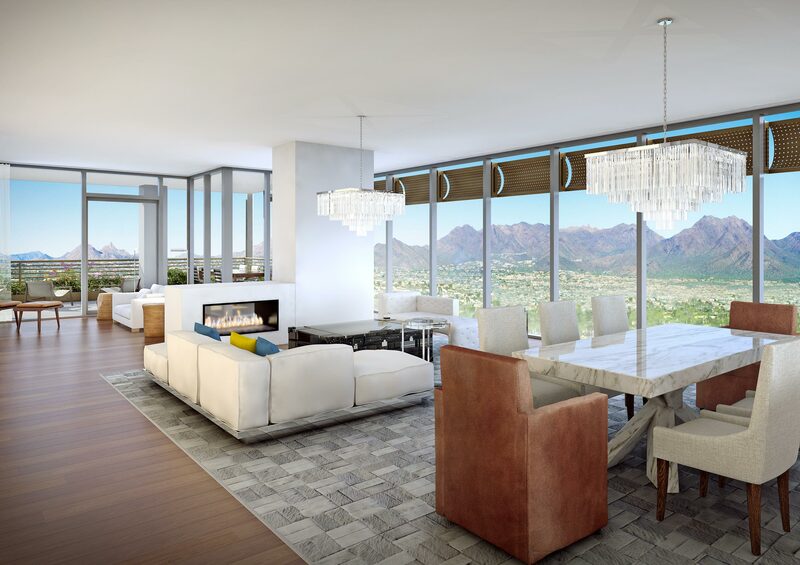 Floor-to-ceiling windows allow a view of the desert and the McDowell Mountains. Overhanging plants outside the windows provide shade and privacy. “Negative edge” railing designs provide dramatic, uninterrupted views of the McDowell Mountains and cityscape, which can be enjoyed from the rooftop lap pool, spa or outdoor lounge areas. Those are a few of the amenities at Optima Kierland, a 12-story condominium tower with 220 luxury residences in Phase 1. “You will feel like you are on the edge of a ship without a handrail,” says David Hovey Jr., president of Scottsdale developer Optima. Hovey always looked for a great location for Optima’s next development, and he had his eyes on the corner of Scottsdale Road and Kierland Boulevard at the border of the cities of Phoenix and Scottsdale for some time. In 2014, Optima purchased two sites there, one a location of a former bridal shop and the other a furniture store, to create a 9 1/2-acre site and build Optima Kierland. The demolition of previous buildings began in September 2015, and excavation started in October 2015. The sales office for Phase 1 opened last month at 15450 N. Scottsdale Rd. The condominium building will be completed in two years, while a second building with 156 apartments (Phase 2) will be built in 18 months and occupancy there to begin in the first quarter of 2017. The development is a chance for Optima to flex its architectural and aesthetic muscle, imagination and creativity for its residents. The vertical architecture includes plants on the edge to provide privacy below, Hovey says. “On a terrace, the foliage from the terrace above provides sun protection, privacy and lowers the ambient temperature as well,” Hovey says. The company’s oversight of architecture, design, construction, sales and leasing allow it to be flexible for residents. “It gives the buyers whatever they want,” Hovey says. Two levels of underground parking also will be provided under the condominium tower. Residents who enjoy recreational sports or exercise won’t have to leave the facility to participate in some of their favorite activities. A glass-enclosed, 16,000-square-foot fitness center features weights, the latest cardio equipment and personal trainers. Residents can use indoor basketball and squash courts, an indoor golf simulator, steam rooms and locker rooms. In addition to a lap pool and lounge areas, rooftop amenities include a therapeutic spa, steam shower, sauna, outdoor showers, full kitchen with a covered bar and fire pits. Community gathering spaces include the residents’ club and party room with a kitchen and full catering. Outdoor leisure amenities also include landscaped courtyards with outdoor sculpture gardens, water features, sun decks, barbecue areas and a dog park. For all the technology and sustainability innovations, Optima Kierland will be the pilot project for Phoenix’s IGCC, Hovey says. “Optima Kierland is a landmark development for us because it embodies our evolution as architects, designers and developers, building on our 38-year legacy of innovating to create places that define new standards in living,” Hovey says.